Argh, there be treasure here. Be quick me matey as there be enough fer 8 of ye. Pirate Birthday Party Supplies and Decorations Bundle|Kit 8 Guests – 200 Pieces Ahoy there Matey! 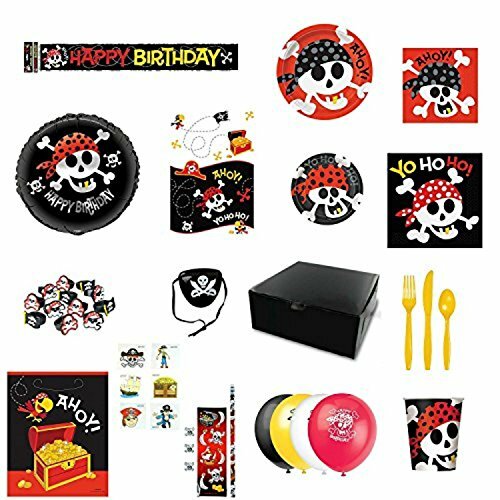 Time to celebrate your little Pirate’s Birthday with this all inclusive: Pirate Ultimate Childrens Birthday Party Supplies Decoration Bundle 8 Guest – 200 Pieces Set Deluxe Pirate Themed Tableware Pack Includes: ♦ 16 – Beverage Napkins ♦ 16 – Luncheon Napkins ♦ 8 – 7″ Pirate Plates ♦ 8 – 9″ Pirate Plates ♦ 8 – 9oz Paper Cups ♦ 1 – Plastic Table Cover ♦ 8 – Knives ♦ 8 – Spoons ♦ 8 – Forks Decoration Kit Includes: ♦ 1 – 12 ft Foil Birthday Banner ♦ 8 – 12″ Printed Balloons ♦ 1 – Foil Balloon Goody Bag Sets Include: ♦ 8 – Loot Bags ♦ 8 – Stationery Kits ♦ 8 – Plastic Rings ♦ 12 – Eye Patches. All Supplies Packed Perfectly in an All Inclusive Party Box.